Norikra is a open source server software provides "Stream Processing" with SQL, written in JRuby, runs on JVM, licensed under GPLv2. Input/Output event streams as JSON objects, which can contain any fields with a target name. Norikra's query is SQL with window specifier support (It's actually Esper's EPL). JOINs and SubQueries are also fully supported. Nested hashes and arrays are available for event values, and directly available from SQL queries. 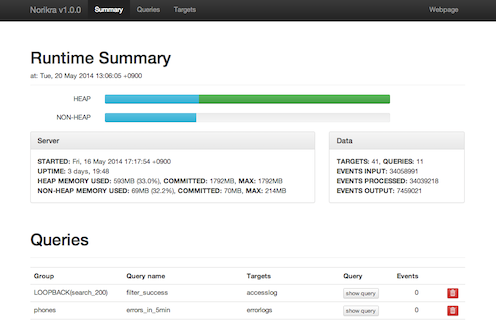 No more restarts required for new processing logs, queries, targets and any others. Only 3 minutes required to install, configure and start norikra server. UDFs can be added as plugins, written by yourself, or installed from RubyGems.org. Listener is the connector of queries outputs. Users can write their own Listeners to send output data into any other systems/storages directly. These plugins are dynamically reloaded after installation on JRuby runtime, by sending SIGHUP to the Norikra process (v1.3.0 or later). Norikra is licensed under GPLv2, and developed in github. Its core engine is based on Esper, which is GPLv2 library for SQL-based event processing. Norikra is always open for users feedbacks and pull-requests. Install JRuby on your machine, and export PATH to jruby. WebUI is available on http://hostname:26578/. Norikra server doesn't save targets/queries in default. Specify --stats STATS_FILE_PATH option to save these runtime configuration automatically. Other options to daemonize: supervisord, Upstart, systemd and others are available. Docker image available. Thanks @myfinder! To add queries and events, use norikra-client command, which included in norikra-client gem and norikra-client-jruby gem. norikra-client-jruby gem will be installed with norikra, but it requires JVM execution waits. Without JVM, use norikra-client gem with CRuby. For example, think about event streams related with one web service (ex: 'www'). At first, define target with mandatory fields (in other words, minimal fields set for variations of 'www' events). Supported types are string, boolean, integer, float and hash, array. You can register queries when you want. And send events into norikra (multi line events [json-per-line] and LTSV events are also allowed). Query www.search matches the last event automatically. For more query details and examples, see Query of Norikra and Query Examples. Events (and all Norikra operations) can be passed by JSON over HTTP. HTTP JSON RPC port is 26578 in default (same as --ui-port). UDFs/UDAFs can be loaded as plugin gems over rubygems or as private plugins. In fact, Norikra's UDFs/UDAFs are Esper's plugin with a JRuby class to indicate plugin metadata. Norikra's UDFs/UDAFs can be written in JRuby, or Java. For details how to write your own UDF/UDAF for norikra and to release it as gem, see README of norikra-udf-mock. Norikra stores query output events into built-in memory pool. With default built-in memory pool, users must fetch these data from anywhere to Norikra server. Listener plugin can receive events directly from query output. So once you wrote Listener plugin, you can send output events to somewhere, RPC endpoint, storage system, distributed filesystems, or anywhere you want. Norikra's Listeners can be written in JRuby. For details how to write your own Listener and to release it as gem, see README of norikra-listener-mock. Norikra handle some Unix signals to control its behavior. None. Duplicate streams and queries before Norikra server. Storm and other stream processing frameworks are framework, not processor. Storm has many features to distribute data and processing, but you should write processing code yourself, and deploy it, and then you should restart your distributed application. Norikra is a stream processor. On Norikra, you should write queries only without any restarts. But norikra doesn't have features for distribution of data and processing. If your service's event stream have huge traffic (over Gbps, over 1M events per seconds), Norikra does not fit for your problems. Storm or other stream processing frameworks work fine for such cases. If there are many small event streams and many fragile queries, Norikra works fine. Furthermore, Norikra's extremely fast bootstrapping helps you to build stream processing PoC or first version of your stream processing system. You can replace it with Storm or others when your event streams become bigger than norikra can handle it. vs Hive? vs Impala/Presto? vs RDBMS? On Hive, Impala, Presto or RDBMS, we should manage when queries should be run, when these queries finished or where these results exists. For results every 5 minutes, we should maintain external system to kick queries per 5 minutes. Many queries at just a same time make troubles by disk I/O performance, swapped memories and high load averages. On Norikra, once query registered, that runs forever. Problems like thundering herd does not occur because norikra's stream queries process events incrementally, and norikra does not use disks. By this reason, norikra is free from troubles of large size HDDs. Splitting event streams is good idea. One is processed on Norikra, and the other is stored on storages, and processed by query engines like Hive/Impala/Presto or RDBMS. Both processing will be written by SQL... it is a variation of "Lambda architecture". We can get result as streams from norikra, and also get as hourly/daily or backup batches from query engines. Listener is a kind of Stream connector, for output event stream. On the other hand, Fluentd and fluent-plugin-norikra available. Fluentd make log collection and delivery extremely easy, and have many plugins to store it on storages or to put it into tools/services for visualizations and notifications. Norikra's stream input is very easy to connect fluentd's output, and Norikra's output is also easy to connect fluentd's input. So we can use Norikra as stream processor on Fluentd's data stream infrastructure. Of course, other connectors contributions are welcome. Please send messages to @tagomoris on Twitter to do it.